El Cid (1043-1099) - Rodrigo Díaz de Vivar (his real name) is Spain's national hero. He was the consummate knight in every sense of the word. 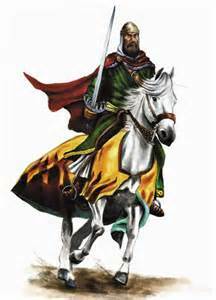 El Cid ("The Lord") was the name given him by the Moors. Catholic Spain called him El Campeador ("The Champion"). He lived during the Middle Ages at a time when the Iberian Peninsula was divided. About half of it (the southern half) was occupied by the Moors who were Muslim, and the north consisted of several smaller kingdoms, which were Catholic. El Cid came from Vivar, a small town near Burgos, the capital of the Kingdom of Castille. As a Spanish noble, he was raised in the court of Ferdinand the Great, Emperor of Spain (Ferdinand crowned himself emperor even though he hardly ruled over the whole peninsula), and served in the house of Prince Sancho, Ferdinand's son. Upon Ferdinand's death and Sancho's ascension to king of Castille in 1065, El Cid was promoted to military commander of the Castillian army. From that point on much of the rest of his life was involved in warfare; both against the Moors, and against Sancho's brothers, Alfonso and Garcia, who had each inherited other kingdoms of Ferdinand's empire. However, in 1072 Sancho was assassinated and Alfonso became the new Spanish Emperor. 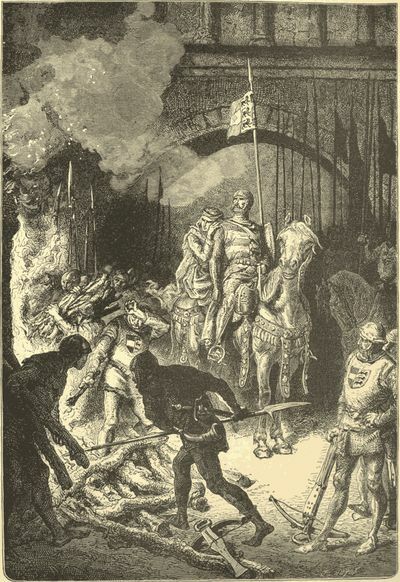 And as one who had been fighting Alfonso, El Cid was forced into exile in 1081. So he did something unexpected...he he joined the Muslims. Now, during his lifetime, the Muslims in Spain were no longer unified under a single kingdom. The Caliphate of Cordoba had been the reigning Muslim force in Spain since the downfall of the Umayyad Caliphate back in the 8th century; but it broke up into what became known as the Taifa Kingdoms in the early 11th century, shortly before El Cid's birth. So when I say he joined the Muslims, he, in fact, only joined a small faction of them. It was the Taifa of Zaragoza on the Northeast coast of the Iberian Peninsula that he went to. From there he battled both the Spanish Kingdom of Aragon, and the Muslim Taifa of Lérida, both of which were encroaching upon Zaragoza. Then in 1086, Emperor Alfonso was defeated by the Muslim Almoravids of North Africa and his situation became desperate. So he made peace with El Cid and convinced him to return to Castille and fight for his homeland once again. Knowing his reputation as a warrior, Alfonso gave El Cid free reign on how he would conduct his war. And El Campeador did not waste it. As a Spaniard who had Muslim allies, he raised a coalition of the two and assaulted the Taifa of Valencia, conquering it in 1094. Most of the rest of his military career was spent battling the Almoravid Berbers, an endeavor at which he achieved great success; however, he suffered a terrible tragedy when his only son, Diego, was killed by the Almoravids in 1097, two years before his own death. When he did die in 1099, his wife, Ximena, succeeded him as ruler of Valencia; a move almost unheard of in the Middle Ages. To this day, El Cid remains one of the most admired individuals in Spain's history.